The total payment will be charged 14 days prior to your arrival. 10% Service Charge + All applicable Government taxes will be applied on the last page. The guest is responsible for ensuring the property is left in a reasonable condition of cleanliness and in the same condition of repair as upon arrival. Any excessive cleaning, loss or damage to the property caused by the guest or any members of their party, or any visitors associated with the guest or charges incurred will be itemised and charged to the guest. Guests are required to act in a responsible manner at all times, and to act with respect towards other guests, neighbours, the management team and their staff. Non guests of Ceilão Villas are not permitted inside the property unless with prior approval from the management. This is to ensure the safety and privacy of all in-house guests. Ceilão Villas reserves the absolute right to require any individual to vacate a property for disruptive or unsuitable behaviour, in which case there would be no refund of any rental payment. Due to health and safety, and well-being of all of our guests, smoking is strictly not permitted inside the rooms. If you wish to smoke, then there are areas outdoors. Please use the pool responsibly and safely, our staff at the villa cannot be responsible for watching young guests in the pool as they are not trained, lifeguards. Please make sure to always shower (there’s a garden shower near the pool) before getting into the pool. 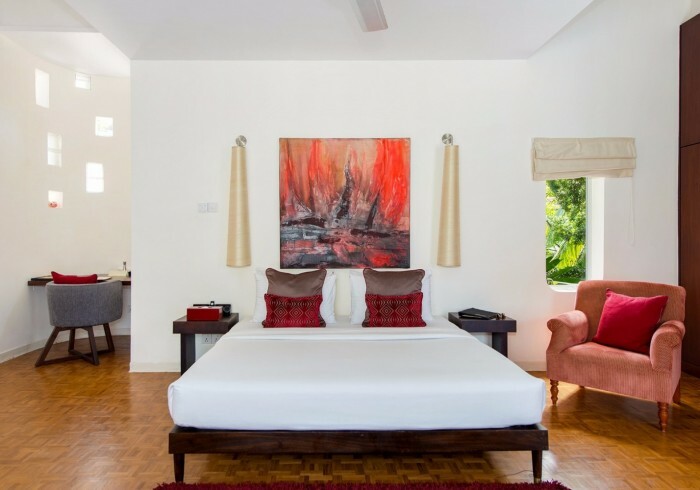 Colombo House by Ceilão Villas is a 5 bedroom boutique hotel located in the heart of Colombo. Individually designed rooms, personalized butler service and calm spaces bring this oasis in a highly residential area to life. Dining areas, snack places, reading spaces, chill zones. Furnishings and feature walls in unexpected bursts of vibrant hue give warm euphoria to cosy corners. Purple, my favourite colour, injects a touch of retro at just the right dose.Friends and family were roped in for the floral-themed ink and other works of art. Together with the exotic cloth chandelier, they add a touch of eclectic at just the right dose.High ceilings, characteristic features, throwback cushions with piping and peppy patterns give distinct reminders of its retro heart. Five bedrooms to choose from, each with its own silky tones, made to order period wooden fittings and cool cement finished en-suite bathrooms.